To bad you did not cite where you got all of this amazing info. I would of loved to see where you got such accurate data! In all seriousness I do hope you know that it' is illegal for any outside country to contribute forwards a presidential election. Next time you blog please try to use REAL facts and figures. The Algerians should have the decency to invest the money into their impoverished country so they don't need help from other Nations. Aaron Fine, who said anything about contributing to the election campaign? 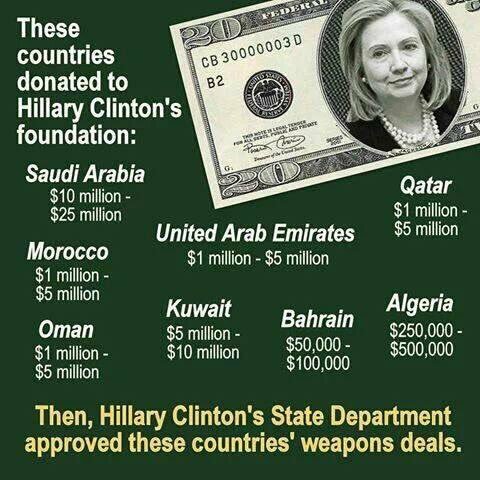 These contributions were to the Clinton Foundation, which is a slush fund for the Clinton family's personal expenses, and also served as a place to park people before the campaign started. Foreign contributions are perfectly legal, except that these were quite obviously bribes.